The bank account is empty but my heart is full of fluttering now that I have received the final product back from the bike shop (they did the ‘fine tuning’ in the end). Here you are, piece by piece. Starting at the top, I have stuck with my trusty Selle Italia SLR saddle, transplanted from the Bianchi. 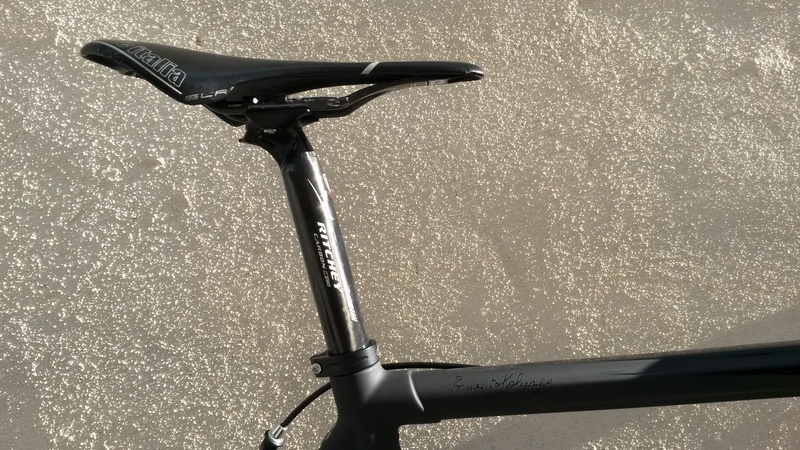 My tender bits seem to like this saddle and, at 125 grams, it’s about as light as you can get. 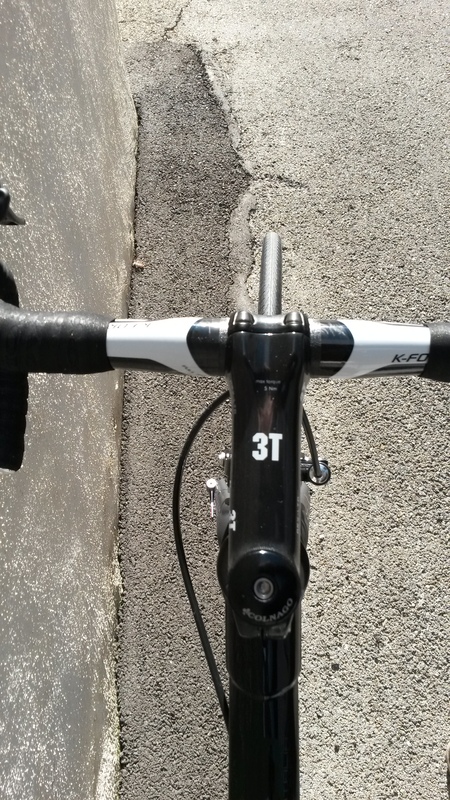 Below it is my nod to the old country (okay, ‘continent’) and a Ritchey WCS Flexilogic seat post. My last post was a Ritchey, but really, I bought it because it was on sale. 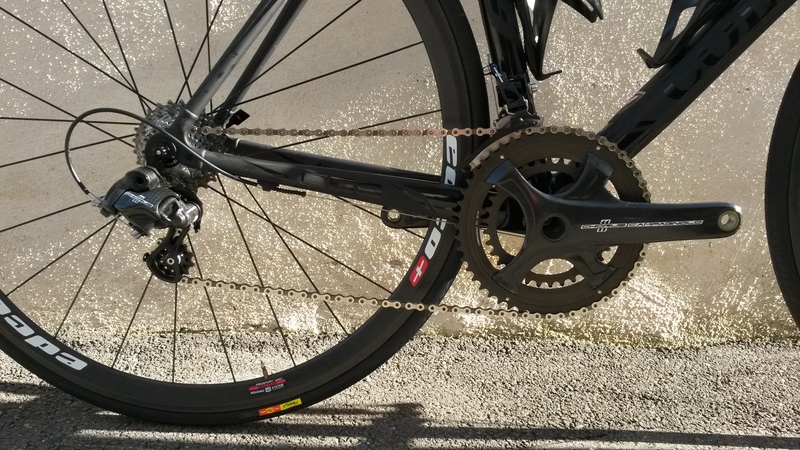 Like I think I told you already, the groupset I chose for the bike is mostly 2015 Campagnolo Chorus. All the components are from this set except the chain and cassette, which are Record. Bling points. Edco has a nice ‘crash program’ for when I smash them to bits on a French roundabout. 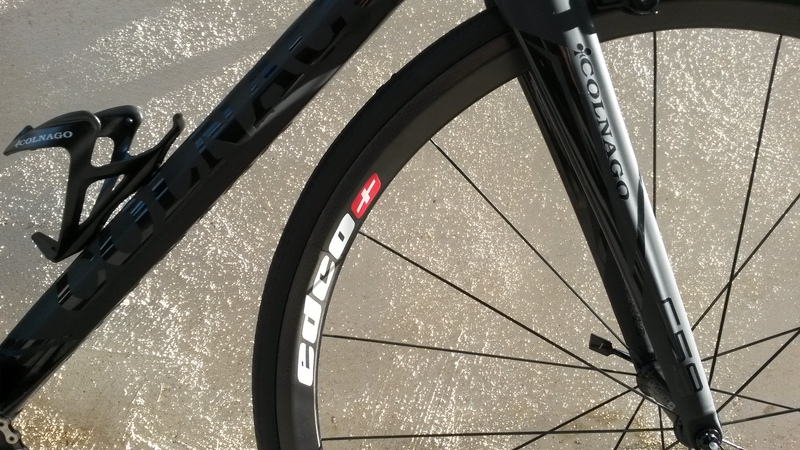 I’ve never had carbon wheels and I needed to know what all the fuss was about. I’m hoping for some of that famous ‘aero advantage’ on the flats. These wheels are manufactured in Switzerland and strung together in Holland from what I can gather. And, as you know all too well by now, the foundation of this lovely build is the handsomest bike frame out there – the Colnago C59. Now I have to get some pedals on this beauty and take it out while it’s still sunny. Ride report coming soon. Thanks, Carsten. Me too so far. Congratulations, Gerry – magnificent steed indeed! The frame, at least, is my ‘dream machine’. It better live up to my expectations! What? No mudguards? Wouldn’t do round here. I hope it lives up to all your expectations. You have put enough thought into it so it should be brilliant. I’m not sure I’d buy anything like this if I lived somewhere wet. I cringe at the inevitable first nick as it is. I’ve had it out on one ride so far, but I’m reserving judgement till I can put it through its paces a bit. I hope that the inevitable nick is long delayed. I hope so, too. It happened on the very first ride of the Bianchi, so i’m ahead of the game so far. You can take a bow, Chikashi. So far those wheels are holding up just fine. Very curious to read your views on the new build once you’ve taken it on a few spins! BTW, do you have something to protect the precious head tube from cable rub? No, but I see from the Bianchi that I might need something. What do you recommend? There are adhesive frame protectors that you can buy from several companies like Lizard Skins, BBB, etc. Alternatively, you can buy little sleeves (I don’t know whether they are rubber or silicon) to put on the cables. Again, several companies, including BBB, offer them, but the ones from SRAM are probably the smallest and therefore least visually obtrusive. Thanks, I’ll give it a look before I do any damage to my bike. I know nicks and scratches are inevitable, but it’s good to know I can prevent this type of thing. Never mind my last comment about chainstay. I forgot that you have internal routing! Looks great, congratulations. I’ll be particularly interested to hear your views on the new Chorus grouppo as I have one lined up for my own build. I’ll do a review later, but one thing that REALLY stood out is the front derailleur. It takes no effort at all to get from the small to large ring now. Very impressive. She’s a beaut, Gerry. Very nice. Any word on the final weight? 15.4 lbs with water bottle holders and pedals. It’s definitely a Middleweight. Nice! 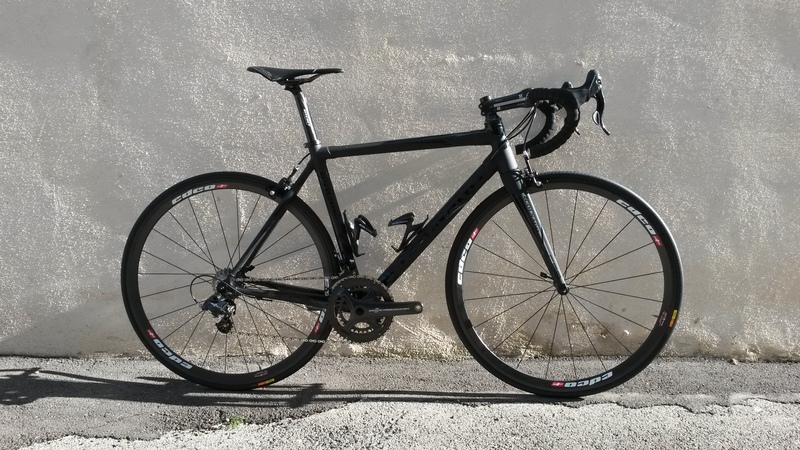 That’s a lightweight my friend – weight is always sans pedals and cages. You’re in the 14’s. Very cool. Oh, if that’s the case, then it’s 14.5 lb. Weighed it without those two things at the shop yesterday. I’m suddenly feeling better about myself! Cheers. My pleasure man. That’s a beautiful machine you’ve got there. I’d say, “enjoy it”, but why? I know darn good and well you’ll be smiling for the better part of the next five years on it. Congratulations man. That is one exceptional bike. Congrats Gerry, tootle pedal beat me to it but along with the mudguards a nice red bell would be perfect. Thanks, Jan. Your prediction is true so far! Not sure if you mentioned it but what tyres do you have on there? And I’ve noticed on some reviews for tyres some people go up from 23mm to 25mm. Do you know what benefit that is? I got some Mavics that the bike shop threw in for free. I don’t really know what they are, but I’m trusting that they’re good! I have been riding Conti 4000s for a year or more now and liking them a lot. Never flat and no complaints on grip, etc. I’ve tried 25s but never had two on the bike at the same time. I never felt any difference, really. Well, maybe a tad ‘soft’ on the ride. It sure seems to be the trend these days though. I’ve been using the same tyres. Excellent. Although I don’t know what I have in my Canyon. They have the new Conti GP 4000s II and there were a few reviews that stated they had gone up to the 25 so wasn’t sure if it was safety or comfort or puncture proof or grip or whatever.